I had first heard of Bali in the movie South Pacific when I was a kid. I love Musicals. I went to school for Music Theater and performed as a singer on a Cruise Ship, in a review in Japan and Miami and have performed in shows across Canada. It seems that wherever we travel to, I always have a song about the city or country in my mind during the entire time that we are there. Bali was no exception and I had Bali Ha’i, Some Enchanted Evening and Cockeyed Optimist playing over and over in my head for weeks. I never thought that I would actually make it to Bali, it was always a dreamland to me. A place of perfection that I had seen in technicolor on a Sunday afternoon. Yet here we were and not only that, we were fulfilling a life long dream of Dave’s. I thought of songs when it came to Bali and Dave thought of Surfing. Who was the original adventurer in this relationship? 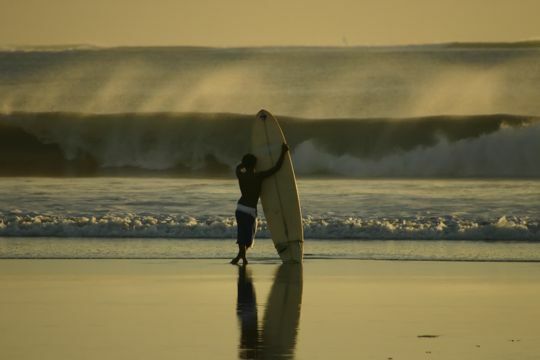 If you are a beginner you should consider going to Bali Surf Camp, they are excellent with people who have never surfed before and offer guiding to those who are more experienced. Excellent accommodation and food as well.